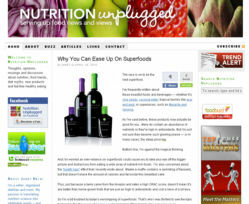 Features: Want to stay up to date on hot nutrition topics with one of the #1 dietitian bloggers? Then make nutritionunplugged a regular read. 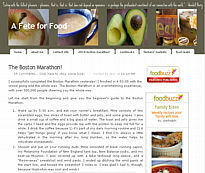 It covers food news, trends, and assorted nutrition info once to a few times a week. Janet blends her nutrition knowledge with her astute understanding of trends and ability to sniff out nutrition quackery. Beyond her regular blog, nutritionunplugged is filled with past blog posts and links to other nutrition and food blogs and websites high on Janet’s recommended list. 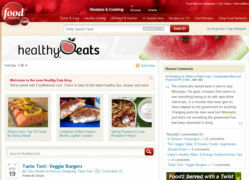 Features: Healthy Eats is hosted by TV Food Network and mixes the talents and knowledge of four dietitians. You’ll find daily posts filled with healthy recipes, spotlights to teach you about new ingredients, the latest food news and common questions with cut to the chase answers. The four RD bloggers provide a wide variety of posts which keeps the blog interesting. 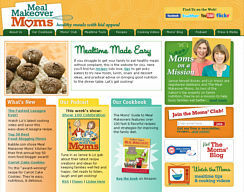 Features: Two RDs- the moms of Meal Makeover Moms - are on a mission to help busy families eat healthier. They strive to offer moms (though Dad’s are allowed on, too) with simple twists to kid favorite recipes as well as novel ways to help kids learn to love the foods they should be eating more of – those fruits, veggies and whole grains. The moms' senses of humor shines through whether you read their blog or listen to their podcasts. You can join their Mom’s Club and receive their regular newsletter and much more. Features: Curious about what’s new in weight loss, the latest dieting fact, fad or myth? Want to know what’s new in bariatric surgery (aka metabolic or weight loss surgery)? 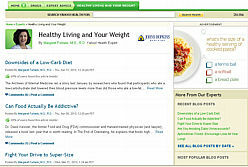 Turn to the yahoo blog of Margaret Furtado, a dietitian at Johns Hopkins Bayview Medical Center, leading expert in weight loss surgery and author of The Idiot’s Guide to Eatiing Well After Weight Loss Surgeryon the increasingly discussed topic of nutrition and weight loss surgery. Her posts are short and poignant. Features: On this blog you’ll read posts on a wide variety of topics written by handfuls of dietitians who are spokespeople for the American Dietetic Association (ADA) – the same dietitians you often see quoted in newspapers, magazines and interviewed on TV. Topics include current nutrition news, newsworthy events, easy tips to follow to live a healthier lifestyles and happenings within the ADA. 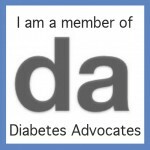 Beyond these blogs, check out other resources from ADA under For the Public. Features: Dietitian blogger and social media guru Janel Ovrut writes this blog (she also contributes to Food Network’s Healthy Eats. 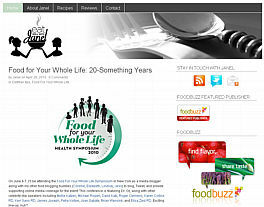 Eat Well with Janel offers nutrition nuggets and tasty and nutritious recipes. A dash of creativity is stirred into all aspects of this blog which is updated a few times a week. Features: This blog, which translated means “A Party for Food”, is filled with friendly from-the-kitchen recounts of Jessica’s cooking explorations. She serves up nutrition guidance and her knowledge of foods and cooking. Her quest is to find “local, wholesome, healthful foods” to nourish the body and mind. Features: Cut to the chase, practical tips and tricks to support your weight control and healthy eating efforts are the line up on this blog offered by vtrim – an online research-based behavioral weight management program. 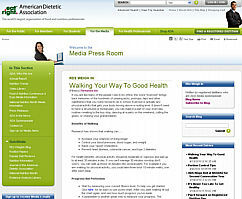 The bloggers are typically dietitians well versed in the ins and outs of weight control. Topics range from How to Make Healthy Dinners Happen to Setting Yourself Up for Long Term Weight Control and Can You Lose Weight and Be Vegetarian – Answer? Yes! Interested in logging on to trim pounds? 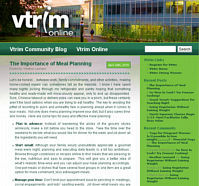 Just click over to the main website: www.vtrim.org. Features: After winning her battle with weight over the course of a few years, Kath followed her passion for nutrition and is no on her way to becoming a dietitian. Her blog chronicles this journey, as she shares nutrition knowledge and healthy recipes. 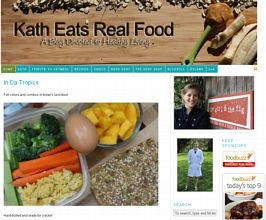 Kath posts every day, providing drool-worthy pictures of her daily eats and new recipes. 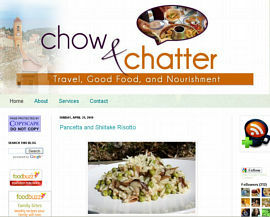 Recently, she won FoodBuzz’s “Best Food Blog” award! Features: This blog is written by a British dietitian who is also a personal trainer. Rebecca now lives in America and brings a fresh perspective on a variety of foods, recipes and her travels. Down the side of her blog you’ll find a recap of recipes and photos to help you plan meals and explore a wide range of rich ethnic culinary concoctions.